In the late 19th century, my great-grandfather Emanuel Michael Rosenfelder left Bavaria and became a circuit-riding rabbi, serving Jewish traders and merchants along the Mississippi River, in Natchez, Baton Rouge, and New Orleans. When he registered to vote in 1876 in Ouachita Parish, Louisiana, the clerk, obviously unfamiliar with Jewish theology, recorded Rabbi Rosenfelder’s profession as “Minister of the Gospel.” In New Orleans, he met and married my great-grandmother, a teenager who had been living in a Jewish orphanage after her parents died in a Yellow Fever epidemic. Fleeing the threat of tropical illness, the Rosenfelders journeyed north up the river and settled in Louisville, Kentucky. 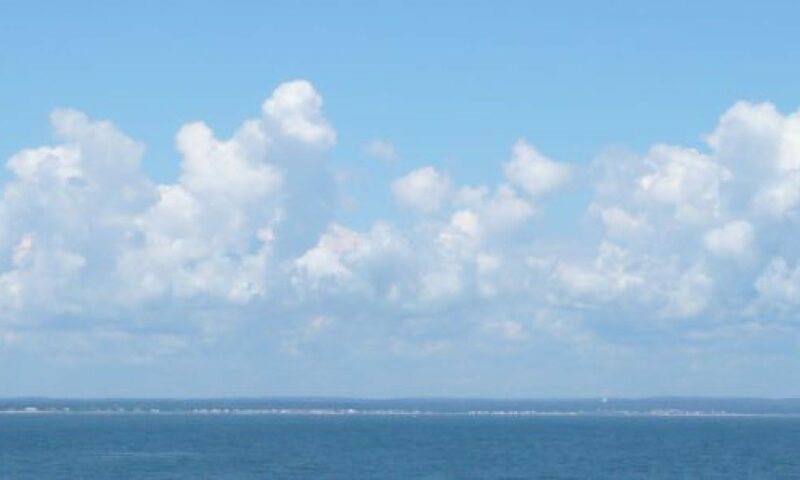 My grandmother was born and raised there, one of eight children, and they gave her a Southern francophone name, Aimee Helen. In preparing for the Passover Seder next week, I turned to Grandma’s charoset recipe, written out for me in her shaky handwriting on a translucent scrap of onion-skin paper. The typical Ashkenazic (European Jewish) recipe for charoset is a mix of chopped apples, almonds, cinnamon and sweet kosher wine, and in many families, the big debate is whether to include raisins. Meanwhile, the Sephardim (Jews from Spain, Portugal and the Middle East) make charoset with desert fruits including dates, figs, pistachios and pine nuts. Charoset, served on matzah as part of the ritual Passover meal, is meant to represent either the mortar used by Jewish slaves when building the pyramids, or the sensual foods mentioned in the Song of Songs. But Aimee Helen Rosenfelder Katz’s charoset reflects the sojourn of her family in the Deep South, surprising us with oranges, bananas and pecans. I grew up on this charoset at Passover each year, and I love the tart sparkle of the oranges, the smoothness of the bananas, the sweet pecans. She was a bit of a southern belle, my Jewish grandma, with very proper manners, and a private girls’ school education. But she was also an intellectual role model, with a French degree from the University of Louisville, and graduate studies at Barnard. During Word War I, she taught French to American soldiers heading off to fight in Europe. Someday, her first great-grandchild, my daughter Aimee Helen, will inherit the charoset recipe, a tangible reminder of the uniquely American story of her Jewish ancestors. At the Passover Seder, we are commanded to explain the religious significance of each of the seemingly incongruous objects arranged around the Seder plate: the egg, the roasted shank bone, the parsley, the horseradish… In the same way, I feel commanded to explain to my children the significance of each disparate family tradition, each story, each character on the colorful plate representing their heritage. Given the complexity and depth and resonance of the stories from our Jewish family, I cannot imagine raising my children solely as Christians. But neither can I imagine ignoring everything else on their family plate. Susan Katz Miller’s book, Being Both: Embracing Two Religions in One Interfaith Family is available now in hardcover and eBook from Beacon Press. I love this post. Thank you for sharing your Grandma’s history and her southern style charoset recipe. I’m adding the ingredients to our grocery list for next week to introduce which will be perfect for our friends attending their first seder with us and my family who is coming for Easter. Wonderful story about your grandma. She would be so proud to know you’re keeping that recipe alive and passing it on to your daughter too eventually. I’m making charoset tomorrow and I’m going to try your Grandma’s recipe (and will link back to you blog and perhaps add a graf from your post here). It sounds delicious. Happy Pesach! I just love this. From Bavaria to Louisiana. What an unbelievable journey. SO much to think about. There are at least three movies in this!! Aimee Helen Rosenfelder’s charoset for the pesach win! Sue, I am weepy. So beautifully written and the picture of the recipe–perfect, powerful, potent. Makes me hungry for the south again. And I love that Aimee Helen added the bananas and pecan…makes me miss the south. And I also love that your great Grandfather was called “Minister of the Gospel”. Seems like you are putting that mantle on yourself SKM–spreading the good news of interfaithness. “Interfaithness” is good news? With our small numbers it will only lead to the end of the Jewish people. Stop kidding yourself. Look up “inbreeding.” Now look up “Tay-Sachs Disease.” You can continue to maintain that interfaith marriages will kill Judaism, but you will be wrong. Any biologist worth their salt will tell you that the only way to avoid genetic problems like Tay-Sachs is an infusion of new blood into the gene pool. 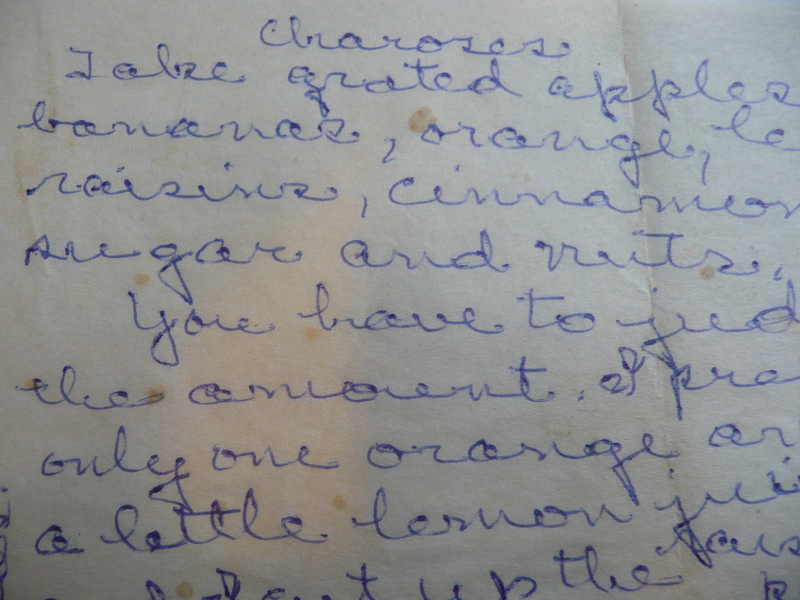 In my beloved Aunt Aimee’s shaky handwriting I take note that the recipe is for CharoseS not CharoseT. No matter how long the correct official Hebrew accent has been declared to be Sephardic, the Ashkenazi still sounds right to me. I will be making my Charoses from that exact recipe, except with almonds. News flash…Aimee Helen’s Charoset makes highly successful debut across pond in London!!! Sue, your Grandma’s recipe was a huge hit at my sister’s Seder table where it was treated as the main course of choice by my nephews, and much appreciated by my cousin and his own Swedish-Italian interfaith family. Sue, Aimee Helen’s charoset went down a treat at our Seder! Gave me a chance to flog your blog too. Can’t thank you (and your Gran) enough for posting this.